What’s that? 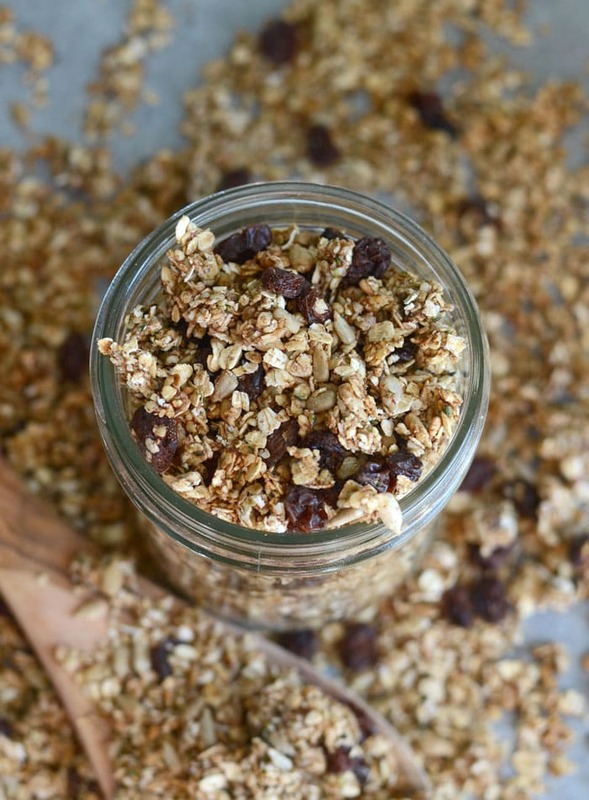 Homemade granola with cinnamon, raisin and banana, you say? Okay, say no more. We can be friends. Actually, why don’t you come on over and help me eat this up before it disappears into my belly again! What else…what else…k, I finished up my 12 week nutrition challenge. 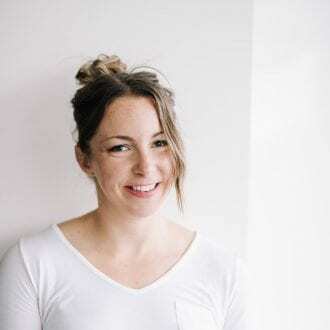 I nailed it right to the end and I’m feeling awesome – it wasn’t really a challenge, I was just tracking macros for 12 weeks to see what kind of change I could make. Now that it’s complete, I saw quite the change in body composition and I’m really happy with the progress I made. I didn’t lose much weight but I definitely lost fat while maintaining muscle. Training is feeling great and I feel really strong. WINNNN! Now what..well, I took about a week off tracking macros but still ate normally and healthy. I’m starting back up tracking macros tomorrow with some new training goals for the next 6 weeks. I plan to continue with slow and steady progress, nothing too aggresive, basically enough to support training but still promote fat loss. I have a 2-day CrossFit competition July 1, so I’m just going to focus on getting in fighting form for that weekend! I plan on sharing more information soon on how to make flexible dieting work while eating vegan but if you missed my series of posts on the subject, you can find them all here. I’m already dreaming up other flavour combinations using mashed banana, applesauce or pumpkin puree to sweeten it and reduce the amount of oil used. 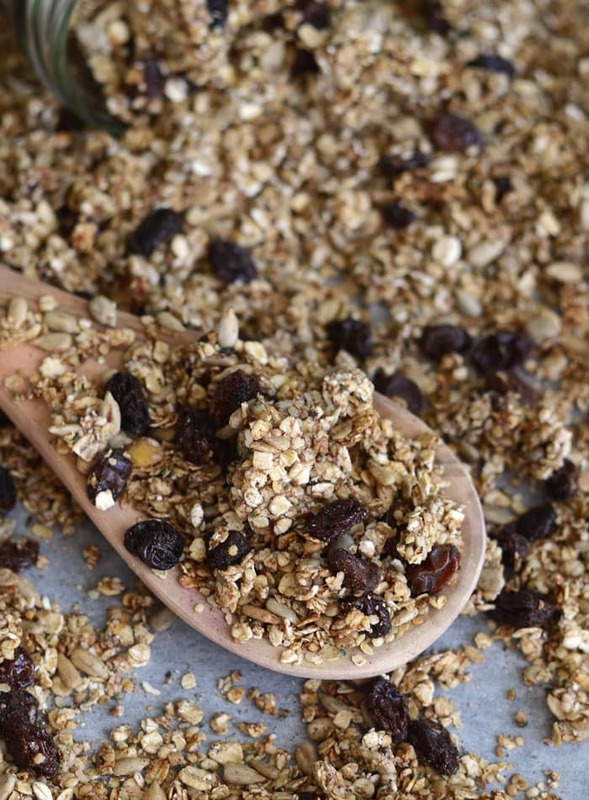 I have posted a few other homemade granola recipes on the blog. There was the mocha granola and the pumpkin spice latte granola, both delicious. 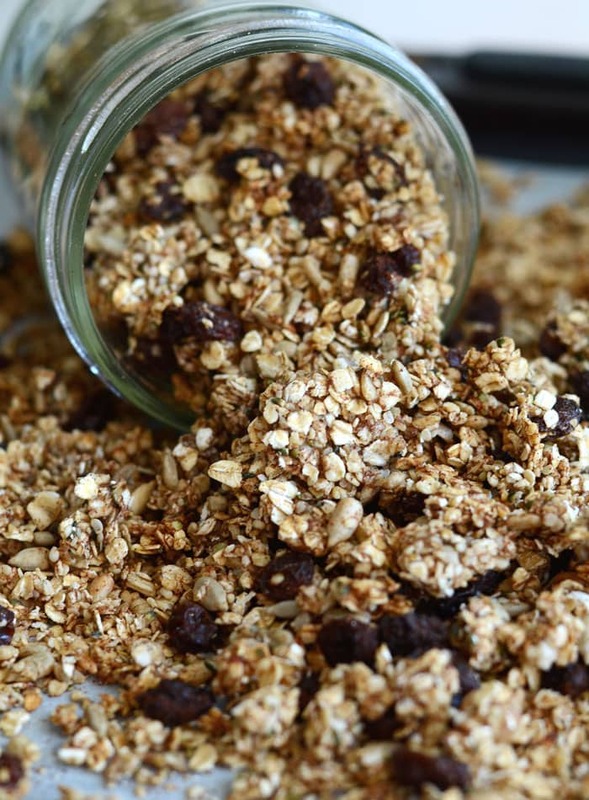 I’m thinking my next batch is going to be a peanut butter protein granola so stay tuned for that! I love homemade granola, it’s super easy to customize, you can make it as healthy or as decadent as you want and you can use it in so many yummy ways. This is so easy to make, just toss all the ingredients in a bowl, mix it up and bake for 20 minutes at 300. It’s absolutely perfect. If you’re unsure where to find raw, unsalted sunflower seeds and hemp seeds, you can find them on Amazon here and here. I love, love, love it with almond milk and sliced banana..it’s die-and-go-t0-heaven goodness. I love the hint of sea salt combined with the sweet cinnamon raisin banana flavour, it’s soooo good! It’s also amazing layered in a glass with coconut yogurt and sliced fruit! Or just eat it by the spoonful, just be careful because it’s freakin’ addictive. Pre-heat oven to 300 degrees and prep a baking sheet with parchment paper. Place the frozen banana in a container in the microwave and defrost until gooey. If you’re using an extra ripe banana, just mash it in a bowl with a fork. Mix the banana and the rest of the ingredients into the bowl, mix well to combine. Spread the mixture on the lined baking sheet. Bake for 20-23 minutes. Be careful not to burn. Let cool completely on the pan before storing. 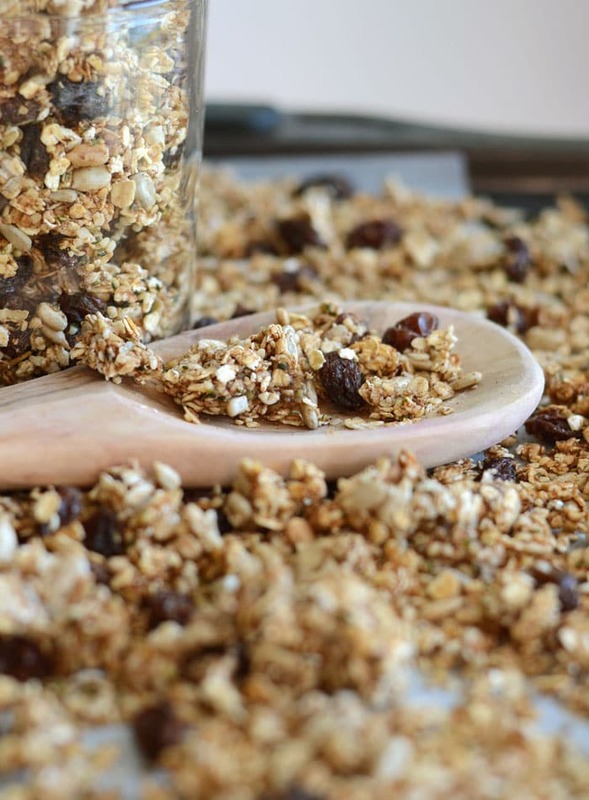 Try swapping out the hemp seed for coconut, or using any other dried fruit instead of the raisins. Chopped dates, dried apricots or cranberries would be delicious. Any diced dried fruit makes a great choice, crushed banana chips would be amazing too! If nut allergies aren’t a concern for you, try substituting chopped pecans, almonds or walnuts for the sunflower seeds. You can also play around with the spices, try a combination of cinnamon and ginger, or maybe a pinch of nutmeg. You could even mix in some vegan vanilla protein powder if you want! If you want to get a little more decadent, try stirring in some chocolate chips once it’s baked and cooled! The stevia drops are optional but recommended. Personally, I didn’t find it sweet enough with just banana but I do have a bit of a sweet tooth so add at your own discretion. I really love the sweet and salty combo in this. You can buy the Stevia I use here. I’d recommend using a good quality, freshly ground, course sea salt in this. It really enhances the flavour and brings it all together.Buy here. I would recommend entering the recipe into My Fitness Pal and making the number of servings 578 (that’s the final weight of whole recipe, you can measure yours to double check). Then when you want to have some, simply weigh it out and make that your serving size ie. 35 grams etc. If you guys enjoy this recipe (or even if you didn’t, please let me know! ), there are a few things you can do to really help me out. Firstly, please come back and let me know in the comment section! I love hearing from you guys. Secondly, share your version on Instagram so I can check it out! Just tag me @runningonrealfood or use the hashtag #runningonrealfood. And, of course, it really helps me out when you share my posts on social media so do take a moment to share via your favourite social network below! Thanks, team, I appreciate it! Lots of love, Deryn. « Previous PostRaw Beet Salad with Chickpeas – Ready in 10 minutes! I have to make this! 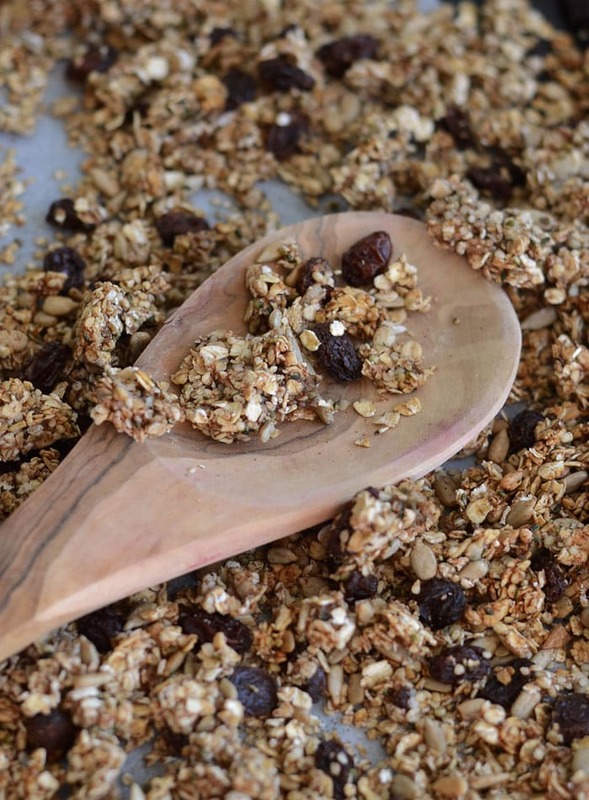 And you have to create the peanut butter protein granola too! Because I need everything peanut butter. Any ideas how I could work the macros for this? Hi Annie – I made a little note on the recipe about the macros! I’d recommend weighing the entire recipe when you’re done then entering that as the number of servings. That when when you want some, just measure it out and put the grams as your servings size. Awesome! I see nutrition breakdown now! Making a batch right now! You are the best, hope I don’t eat it all in one sitting. Great recipe! 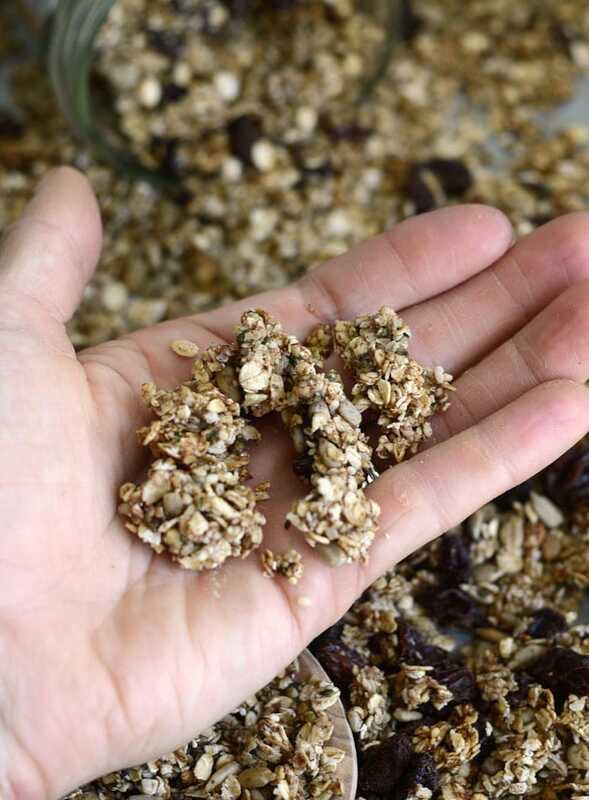 I’m looking for like this type of recipe where using oats. We also get calories, fat and protein also. We also can get protein from ***best tasting protein bars***. You’re welcome, Laura. So glad you enjoyed it. Just made this for the first time!.It smells great! I love the peanut butter granola too! I make it way too often! Oooh, jealous that you have a fresh batch! I’m glad you liked it. 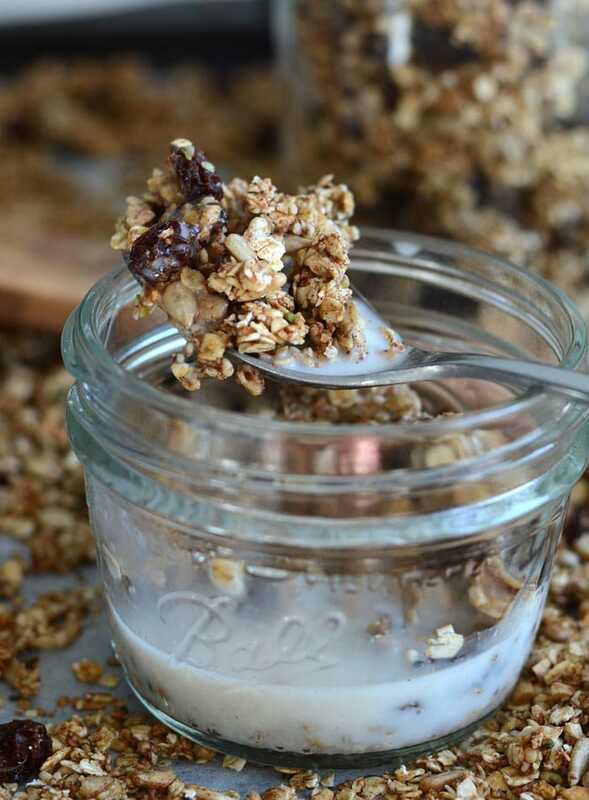 I need to make the PB granola again asap! Thanks for your comment.